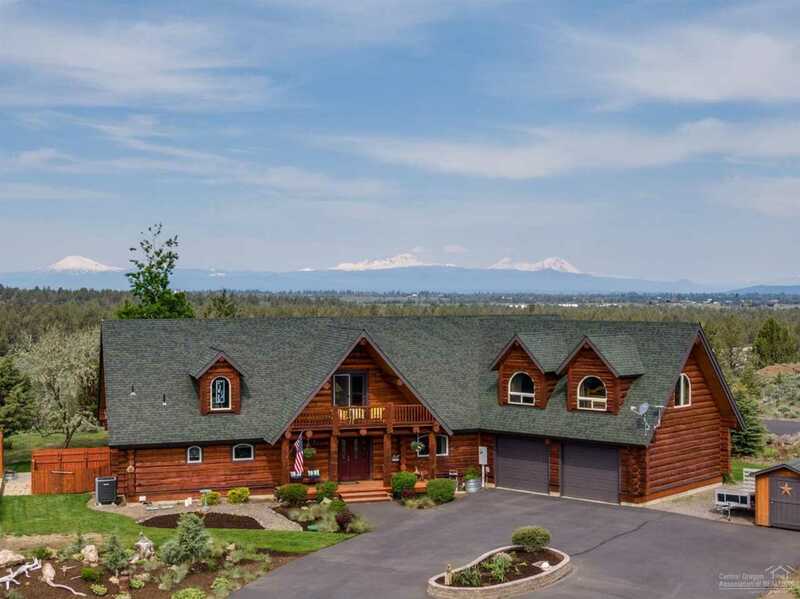 Stunning custom Oregon Log Home with PANORAMIC MOUNTAIN VIEWS adjacent to miles of BLM. Over 100k in recent upgrades including a gorgeous new kitchen with elegant white cement counters, under cabinet lighting and a 120 bottle wine fridge & bar area. This home is light and spacious with a warm and inviting gas fireplace and it's massive logs in a open great room concept featuring some custom carvings and floor to ceiling windows facing the mountains. The backyard features a deck, paver patio area for grilling and a yard with a water feature. There is nothing better then a soak in the newer hot tub while watching the sun set over the cascade range. Master on main, 3 bedrooms and a large storage area off the loft that could be finished into another room. Very quiet, private, great neighbors and lots of wild life viewing makes this the perfect forever home. Stained/caulked/painted exterior less then a year ago. I was searching for a Property and found this listing (MLS #201902552). I would like to schedule a showing for 60405 Sunridge Drive Bend, OR 97702. Thank you! I was searching for a Property and found this listing (MLS #201902552). Please send me more information regarding 60405 Sunridge Drive Bend, OR 97702. Thank you!